I have been at Eyecare Associates in Marshalltown since 2014. I enjoy finding creative solutions to make our optical more efficient so I can better serve our patients and practice. It is exciting to develop relationships with our guests and exceed expectations for their visual needs while looking and feeling great in their eyewear. The optical industry is a wonderful career path that I am thankful to be involved with. I was excited to gain my ABO Certification in November of this year! In my free time I play guitar and sing at local venues, golf and recently completed my first and second half marathons. I have a mini bulldog, Iggy. She isn’t the best running partner–but great company nonetheless. A certification from the American Board of Opticianry is not required in all states. It is only required in 23 states, Iowa not being one of them. So why should we spend our time and money on becoming certified? For one, it shows to the industry that you are qualified and competent. It proves you take pride in your profession and in maintaining up-to- date skills and knowledge. The ABO exam is a baseline of knowledge and skills that an optician should possess- a professional distinction. It is a standard of competence and it provides opportunities for increased earning power and job opportunities. Telling your employer that you deserve a raise because of your job performance is one thing, showing a measurable standard by possessing your ABO certification is another. It is not a state standard, but a national one, which means that if you happen to move, you will be recognized in that state as well. At Eye Designs in West Des Moines, I take considerable pride explaining to patients that all four of us are certified opticians and that Joe from grocery isn’t handling their order today. That is key, because to the consumer, they have no idea what ABOC stands for behind their optician’s name or that there is a certification for an optician to earn. Your doctors should highlight this in their conversation with patients “&quot;We have excellent board-certified opticians in our optical area. I hope you will work with them because then I will know you are getting the best optical quality and care in producing this prescription.&quot;. That extends the trust and respect that the patient has for the doctor to you in a powerful way. Lastly, the American Board of Opticianry requires you to take continuing education to maintain your certification. Often your labs and the Iowa Optician’s Association provide access to fantastic instructors free of charge to you (and maybe free dinner too) to assist you in obtaining the necessary credits. These credits range from technical aspects of our industry to marketing and branding, constantly keeping you informed and better educated to serve your patients. If being ABOC is so great, then why isn’t everyone certified? There are a lot of reasons, but one of the most cited is that taking the test is a big commitment and stressful. 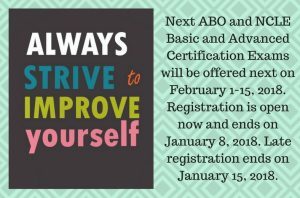 Lucky for you, at this year’s conference on April 7, Bob Russo is teaching an ABO prep course which will be a fantastic resource for you in your journey to become ABOC. Most prep courses range from $150- $300, but our board values education and will be taking a majority of the cost on, making the class an affordable $80! A patient tells me she is concerned about the effects of her screen life on her eyes, from the eight hours of work at a desktop to the additional evening hours (more than she would like to admit) on Facebook, Insta, Snap, Pinterest etc. She also tells me she wants thin and light lenses, a great Crizal no-glare and Transitions. The result, I want to give her a hug--or hire her. This is an educated consumer. The modern version of your grandpa kicking the tires of every Buick he can find before making a decision. But, how many of our patients are this informed or interested in the details of their eyewear? And if they aren’t who’s fault is it? There is probably enough blame to go around, but the most prevalent and favorite villain of any ECP would be the duplicitous online retailer. The "in-and-out opticals" of the world following close behind. Warby Parker is 47th on CNBC’s “Disruptor 50 List” released earlier this year. The company founded in 2010 is valuated at $1.2 billion by CNBC and took in $220 million in 2016 doubling its $110 million mark in 2015. Dave Gilboa, co-founder and co-CEO of Warby Parker, likes to tell the story of how he decided to take on the optical industry. 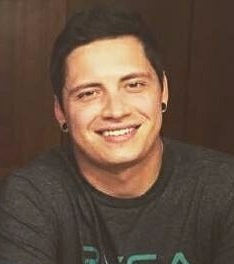 He lost a pair of glasses as a college student while backpacking as he tells The Atlantic. This is an effective anecdote that clearly resonates with people. More so, it makes one nostalgic for the days when an iPhone cost $200. It is true Gilboa could have paid $199 for the iPhone 3G, which had just been released the Summer of 2008. $199 would have gotten him 16GB of storage versus, $299 for 32GB or just $99 for 8GB. Just as Gilboa had choices in the quality of phone he purchased he surely had options when he was at his eye doctor’s office. A couple months later he may not have been happy with 16GB, because after downloading some music and taking photos it was full. Many are probably having similar buyers remorse with Warby Parker. The difference is that Gilboa had options at the Apple store and his optometrist--with Warby Parker the choices are less extensive. This exposes both a challenge and an opportunity. The challenge is that our patients’ views on the importance and complexity of their eyewear is being diluted by the simplicity of the online market. We know glasses aren’t a commodity like iPhones--do our customers? Nevertheless, I think the opportunities are greater and far more encouraging. If you are sitting face-to-face with a patient, what would drive them to an online retailer rather than make a purchase that day in your office? Is it more convenient? You wouldn’t think so because he/she is already in your office, there is a great selection of frames and an expert like yourself to guide them. Maybe they have to get back to work, pick up the kids, can’t see well because of dilation or they’d rather do the thing at home in their Spongebob slippers, a glass of vino and zero pressure. How can you deliver the experience they are looking for and keep their complete eye care in house? You could send them home with some frames to get input from friends (like Warby’s program). 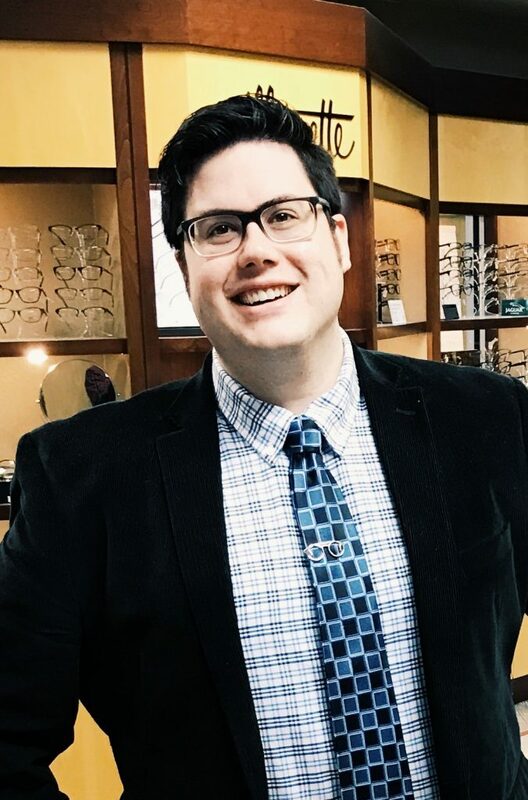 Or you could direct them to your online optical store where their RX and PDs are already available along with frames recommended based on face shape, eye size, bridge and temple length. The patient finds a frame they like and can see if it’s available in your physical space or can order it to the practice to see. They can even instant message the optical staff with questions. During the time on your online shop they are being offered fun, attractive and interactive information about the technology they should have in their lenses--the real meat of glasses. Your practice doesn’t have an online store or virtual fitting site? Why not? More than anything else it is most likely comes down to price. We circle back to options. You may not want to lead with your complete eyewear package for $69. But the patient should know you have it before they walk out the door. Of course we should always recommend premium products as the solution to the patient’s visual and health needs. But they should also know you can match, beat, or come close to the prices they are seeing online and if you can’t, why. It is a delicate dance. In the early stages of Warby Parker the pulling point was that eyewear is a great fashion accessory and frames shouldn’t be so expensive. Frames should be comfortable, fun (if you want), they should be representative of who you are. We know glasses are more than frames. As ECPs we know the real juice is in the lenses. Only secondary to having a complete analysis of the patients’ eye health and detailed communication with his/her additional health providers. Warby Parker is learning the predecessor to Eyewear is Eyecare. 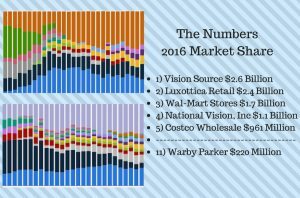 Warby has 62 physical locations in the US (probably more by the time you read this). The company is now offering “Comprehensive 20-Minute Exams” at 13 locations and has contracts with eight insurance companies (Eyemed, VSP, Davis, BCBS, UHC, Cigna, Aetna, Humana) and also taking HSA/FSA plans. Extending beyond the convenience of home online shopping Warby Parker has developed a brand and experience that independents can’t ignore--and shouldn’t. So, in a way Warby Parker is realizing it needs to become more like us by offering some form of actual eye care. And there are lessons we can learn from them too. The experience is really important--understanding our patients as consumers is really important. The difference is we have a big head start and far more to offer--we just need to do a better job of making that clear to everyone else. Jill Morrison and her husband Bob. Jill served Pech Optical for nearly 25 years and retires this year. 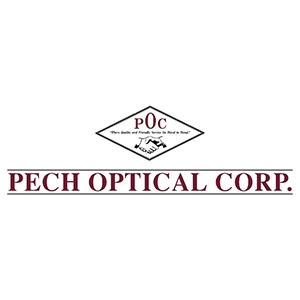 No more alarm clocks, early mornings and icy winter driving for Pech Optical's outstanding and dedicated representative. 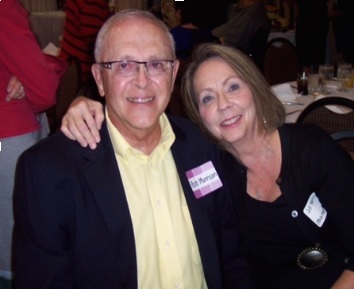 The Opticians Association of Iowa would like to congratulate Jill Morrison on a new chapter in life--retirement. I can personally say that Jill will be dearly missed by myself and everyone that had an opportunity to encounter her. Jill worked at Pech Optical for 24 and a half years. One of her favorite memories was a trip to San Jose with Bob Pech and several other employees. Bob recalls all the turmoil Jill caused, "She knocked out a window on the third floor, illegally picked sea shells and stood up on a view ride over water." Bob laughed every minute of that trip and knew he had found a dear friend. He loved going to dinner or lunch with her because that meant dessert rather than a meal. Bob said it right, "You can't find a better girl than Jill. She is a true person who sincerely wants to help others. A first class lady." It was a humbling and educational trip for her. Jill knew she had landed her dream job and was aware she was working with a true visionary in the optical field. She will miss her accounts and everyone at Pech. Jill cherished and devoted herself to her accounts. They grew into wonderful friendships. Jill plans on relaxing for a few months before finding a part time position. She would like a little break to enjoy leisurely drinking her coffee and reading her daily devotions. She and Bob look forward to short trips. They are true Iowans who enjoy the Winter in Iowa. We wish Jill and her husband the best! Thank you for all the years you have supported opticians in Iowa, Jill! 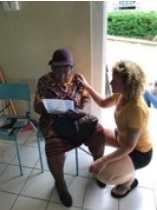 I recently went on a mission trip with iCARE to Jamaica. Clinics were set up in Duncans, Trelawny and Brompton, St. Elizabeth. Overall, 3,864 people were helped by the dedicated volunteers. There were 38 cataract procedures performed, 355 custom made glasses were made and thousands of donated glasses were dispensed. It was an enriching and humbling experience for me. My standout moments were watching a 9-year-old help from start to finish make her and father's glasses. Also, an 83-year-old woman was able to see distance and read for the first time in a very long time. Both child and woman were high hyperopes with 2 diopters of cyl. I'll leave you with my favorite quote, "It's important to give back to the profession that has given so much to you." 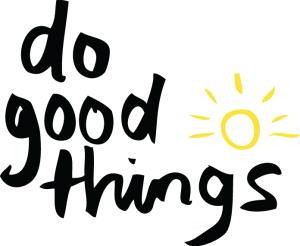 If you get the chance there are many ways to help locally, nationally and internationally. On Paper, a trunk show is the perfect plan. A rep brings in all their product, your opticians are bright-eyed and busy tailed, you have cookies and wine, and you make thousands of dollars. Because if you build it, they will come, right?? Unfortunately, as many reps will attest to, that is simply not the case. A trunk show, as cliche as it sounds, is an iceberg. The tip is the day of the event and the 90% that remains is the six months of work it takes to pull it off. Eye Designs picked donuts, hoping that the popularity of Hurts Donuts would get people to at least stop in. There were donut decorations everywhere! A trunk show can span over several days or fall on a single day. Eye Designs opted for one full day, staying open later one hour. Local is preferred. If you can't get a rep from your neck of the woods, it makes it easier on them for a long day, travel, hotel, and if they don't end up selling a lot of frames it is less of a financial burden on them. Front desk blocked out the schedule for that day only allowing routine exams and emergencies to be booked, as it came closer to the vent, they encouraged routine exam to book on that day explaining there was to be a fantastic sale that they could take part in. Eye Designs went with "One Sweet Deal"
Serving platters, tubs, tables, tablecloths, lights, etc. Are the tables too close for comfortable browsing? Will the food area cause a disturbance in the flow of the practice? There isn't one plan that will fit every office, but following these steps, Eye Designs had their most successful trunk show ever, ending at eight times their normal business for the day. Do you have any tips on how you throw your trunk shows? 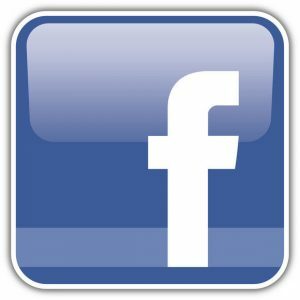 Write in on our Facebook group "Iowa Opticians!"